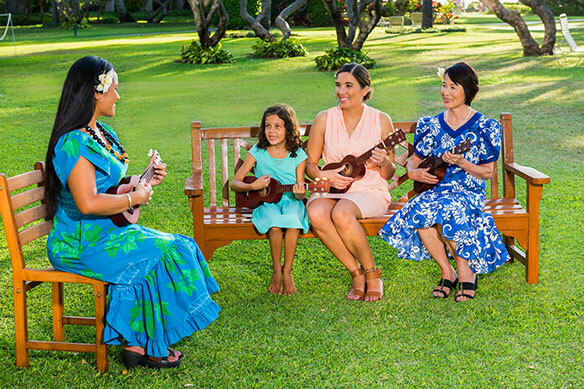 (Photo above: Ukulele lessons are among aspects of Hawaiian culture guests at the Ka’anapali Beach Hotel can be familiarized with. School isn’t out for Ka’anapali Beach Hotel guests wanting to brush up on their Hawaiian language skills or other aspects of Hawaiian culture. The Maui resort – which bills itself as “Hawaii’s most Hawaiian hotel” – has an array of complimentary Hawaiian activities available for its guests, including language classes, ukulele lessons and pineapple-cutting demonstrations, reports John White, the resort’s director of sales & marketing. Enabling guests to be familiarized with Hawaiian culture was a decision the resort’s long-serving general manager decided upon years ago, and resort efforts have won it the appreciation of a Hawaiian foundation that actively promotes Hawaiian culture. White notes that resort guests will find complimentary Hawaiian entertainment in the resort’s courtyard six nights a week, with hula dancing among that entertainment. Ka’anapali Beach Hotel guests will see Hawaiian influences in their rooms as well, which feature such touches as ceiling fans. The oceanfront property – located on 11 acres of tropical gardens – also offers water sports, including paddleboarding, with a six-person board among paddleboarding options. The Ka’anapali Beach Hotel’s Tiki Bar is the first outdoor bar on Maui, while the Tiki Terrace Restaurant serves Hawaiian dishes. White says whales gather off the shore in mid-November and remain there through April. The whales can be visible from the shore and whale-watching tours are also available. White says Ka’anapali Beach has at times been declared the best beach in the United States, with those giving it that tribute including the prominent Doctor Beach. The Plantation Inn attributes include a Michelin-rated restaurant. White says The Ka’anapali Beach Hotel is a family-friendly vacation retreat, while The Plantation Inn is more suited for couples and is within easy walking distance to all of Lahaina, which among other things offers numerous shopping opportunities. As well, those staying at The Plantation Inn have resort privileges at The Ka’napali Beach Hotel, among other things, being able to attend the hotel’s cultural classes. White says Maui is a green, mountainous part of the world, with one of its peaks topping 10,000 feet. Those exploring the tropical island can go on a winery visit and see a distillery, with vodka made from the iconic Hawaiian fruit of pineapple available, he notes. Those wanting further information can access kbhmaui.com .